Chanel EB - Super AA Friendly and Ready for FEI! 2008 16 hand Friesian mare by Tjesse out of Ster Mare Elly D by Wander. 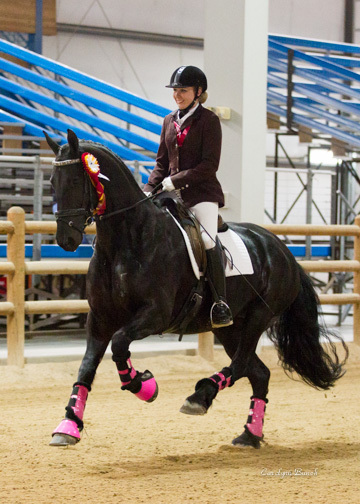 "Bunny" is a super horse for an amateur or junior rider looking for a steady and reliable partner to continue on to the FEI with. Bunny is solid 4th level/schooling all I-I movements with a rank beginner! Correct and very expressive gaits. She has shown extensively at Training and First level with an amateur rider, very seldom scoring UNDER 70%!!! She is extremely tolerant of beginner riders, but wonderfully suited for anyone looking for a competitive upper level dressage mount.